The earliest mention of the camps of the Five Directions is found in the Daojing (道經) from the Han (漢) and Jin (晉) Dynasties in China; perhaps the concept of the camps of the five directions dates back to the Han Dynasty or even earlier. The Camps Of Five Directions(五营) are able to drive off plagues and devils, with the power to ward off evil spirits; establishing the five camps in a settlement gave symbolic significance to demarcating territory and also allowed the people to believe the space in which they resided was a place under the protection of the main god of the settlement temple and the marshals of the five camps. *Most Temples in Taiwan use this formation. *Follow the formation found in The Record of 36 Celestial Generals (三十六天将). In some Taiwan Regions, "Wen (溫), Kang (康), Zhao (趙), Ma (馬) and Li (李)" Battalion Formation will be used. The High Level 5 Camps Commanders: "Zhang (張), Xiao (蕭), Liu (劉), Lian (連), Lee (李)"
These High Level Camps Commanders are given the Title: 圣者 (Sheng Zhe) - Holy Saint. These Middle Level 5 Camps' Commanders are given the Title: 元帥 (Yuan Shuai) - Marshal. * There are still many other groups of 5 Camps which will not be discussed. In popular belief, all temples in the region were divided into inner and outer camps; the inner camps were established within the temple as the “head of the five camps (五營首)” or the “banner of the five camps (五營旗)”, dedicated to the main god. The outer camps were called the “five forts (五營寨)” or the “temples of the old general (將爺廟)”; centered around the temple, they were divided into five elements or five colors: “East-South-West-North-Center – Blue-Red-White-Black-Gold – Zhang-Xiao-Liu-Lian-Li”. The central camp was established in front of the temple or in the center of the settlement; the other camps were established at the gates of the settlement on the main roads in each of the four directions or at intersections. The eastern camp was the Jiu Yi army (九夷軍)(the blue dragon), with 99,000 troops and horses; the southern camp was the Baman (八蠻) army (the vermillion bird), with 88,000 troops and horses; the western camp was the Liu Rong (六戎) army (the white tiger), with 66,000 troops and horses; the northern camp was the Wu Di (五狄) army (the dark warrior), with 55,000 troops and horses; the central camp was the San Qin (三秦) army, with 33,000 troops and horses. Symbolic representations of the marshals of the five camps are extremely diverse; some are represented in portraits and statues; some are depicted on strips of bamboo or prayer flags; some are even venerated in small shrines; but all of them have specific ceremonies for them to function as the marshals of the five camps. These ceremonies include setting up camp, breaking camp, donating to the army (with a bonus to the general), etc. Each settlement held these ceremonies at times according to their own customs. To the present day, the five camps still operate in settlements according the old traditions; they are a form of popular belief that has a very slow rate of change and also allows settlements to have more places of interest with cultural significance. 3) Jie Jie Ding Fang (结界定方), this is a procedure to set the Territory for the Marshals and Armies to stand guard, etc (Mend for External and Internal Camps). 5) Dian Jiang Shou Ying (点将收营), this procedure only occurred at the end of the whole Ritual/Ceremony, this is to send back all the Marshals and their Armies to their respective posts (各营皆回各自岗位). The rewarding the troops (犒軍) ritual is common in settlements mainly populated by Hoklo (福佬) migrants. In traditional society when faced by disease or invasion a “ritual expert (儀式專家)” would be invited to conduct the rewarding the troops ritual to “relieve disaster (消災解厄)”; a “release of the troops ritual (放軍)” would also be held to dispatch divine troops to guard the boundaries of the village, after the troops had pitched camp, the rewarding of troops ritual had also to be held on a regular basis. The most distinctive rewarding the troops ritual in Taiwan is held in Penghu (澎湖). At dusk on the first and 15th days of the lunar calendar, the village temple “incense burner (香爐)”chosen for that year lays out a table with an incense burner and cooked five offering, Joss paper and rice wine in the temple square, inviting the 36 divine generals to partake. Under the table there is a tiger god statue, incense burner and raw three offerings, rice bran water and straw for their horses. Local families successively place food on the offerings table in front of the temple. 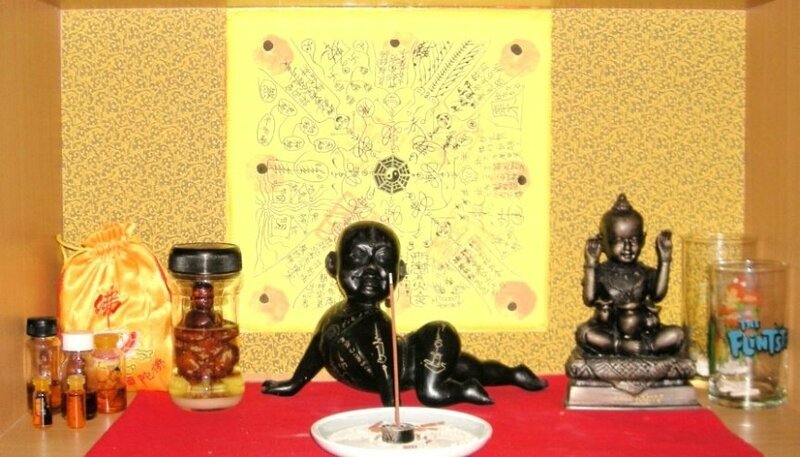 The head exorcist (小法) of the six exorcists, the “ling ling (領令),” burns incense and hits the table with a wood sounding block, then, holding a ritual whip, carries out the altar opening, whipping and altar purification rituals. The members of the exorcist group on either side chant and beat drums while the exorcist (a trainee) holding the five camp order banner (五營令旗) and the ling ling who represents the marshal (元帥), respectively call the troops and horses of the five camps to the temple square (廟埕). After their arrival is confirmed by the throwing of divination blocks (擲筊), the troops and horses are inspected and rewarded. After the reward ritual, the troops are ordered back to their posts. Before religious rituals are carried out in a temple fair the five camp divine troops who guard over the village boundaries need to be called back to stand guard and, each time, they have to be rewarded for their effort through this reward ceremony. The camps of the five directions (五營) are represented by blue, red, white, black and yellow triangular flags (三角令旗), each camp having its own commander, name and troop number:General Zhang (張將軍) leads the east camp nine barbarian tribe army (東營九夷軍) of 99,000 troops to guard the east; General Xiao (蕭將軍) leads the eight barbarian army (八蠻軍) of 88,000 troop to guard the south; General Liu (劉將軍) leads the six rong army (六戎軍) of 66,000 to guard the west, and General Lian (連將軍) leads the five di army (五狄軍) of 55,000 troops to guard the north; Marshal Lee Nuozha (李哪叱元帥) leads the three Qin army (三秦軍) of 33,000 troops to guard the center. The rewarding the troops ritual comprises of three parts: the ritual expert, the temple and five camp heads (五營頭, space and buildings) and believers, consequently, the rewarding the troops ritual in each area is affected by 1)the faction the ritual expert belongs to and their scope of service 2) the main temple and branch temples 3) the distribution of believers, and, thus, the contents differ. 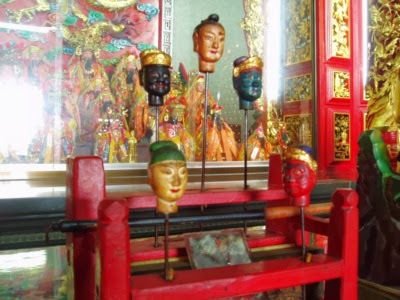 For example, the rituals carried out by a Daoist priest (道士), a ritual master (法師) or a six man exorcist group are different in terms of ritual intervals and form; a rewarding the troops ritual that has believers but is not held at a temple or lacks a ritual expert can be classed as a household ritual not a settlement ritual. New religions that have sprung up in recent years, such as Cihu Temple (慈惠堂) in Songshan (松山), Taipei (臺北), even feature ritual experts wearing holy robes rewarding the troops with tang yuan (湯圓, glutinous rice balls) fruit and vegetables.